Most of the patterns we have been following over the past couple of weeks have completed at their initial targets. The definition for a gartley pattern requires B to be a 61.8% retracement of the XA leg, and C between 38.2 and 88.6% retracement of AB. the 127% BC extension is perfectly inline with the 78.6%XA level, so we have a near perfect pattern. Since the large range bar after the entry of the start of the CD leg we have seen TD-pressure declining, and depicting a bearish divergence. Does this mean it’s going to reverse here? Not necessarily, this pattern can morph into a butterfly with target between 127 and 161.8%XA. going from here my strategy will be; as long as it can hold above the PRZ, use the depicted levels as targets; the 88.6%XA, the Monthly 161.8%XA at ATH, which by the way is very close to a 161.8% projecion of BC (not depicted in the chart). On the short Timeframe, 5minute chart, SPY also completed an AB=CD pattern on Friday: both the lower PRZ and D were tested within a penny or so. I have no positions, and going to just watch the action in the morning. I’m thinking we could see a little bit of a pullback from these levels. 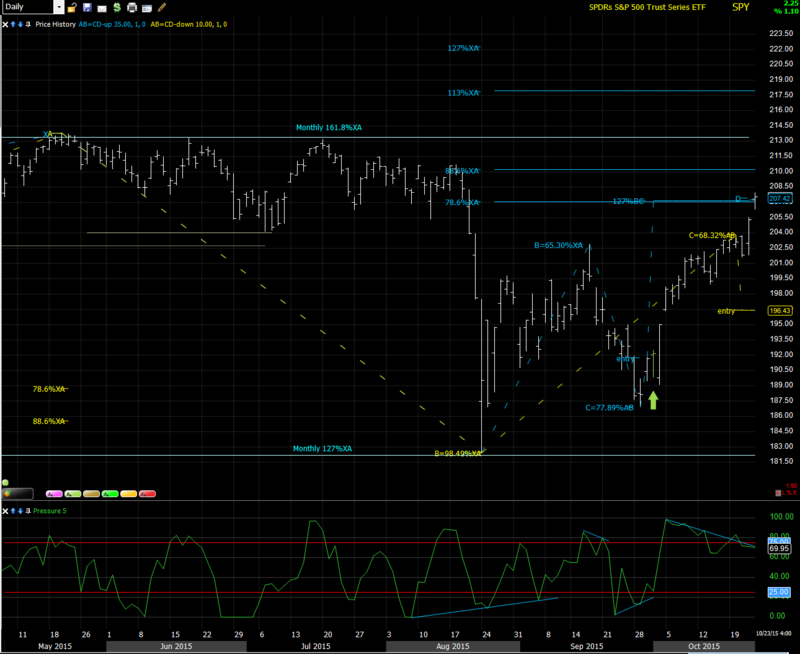 so if it gets to a bullish PRZ on short TimeFrame, we can watch for a reversal again. 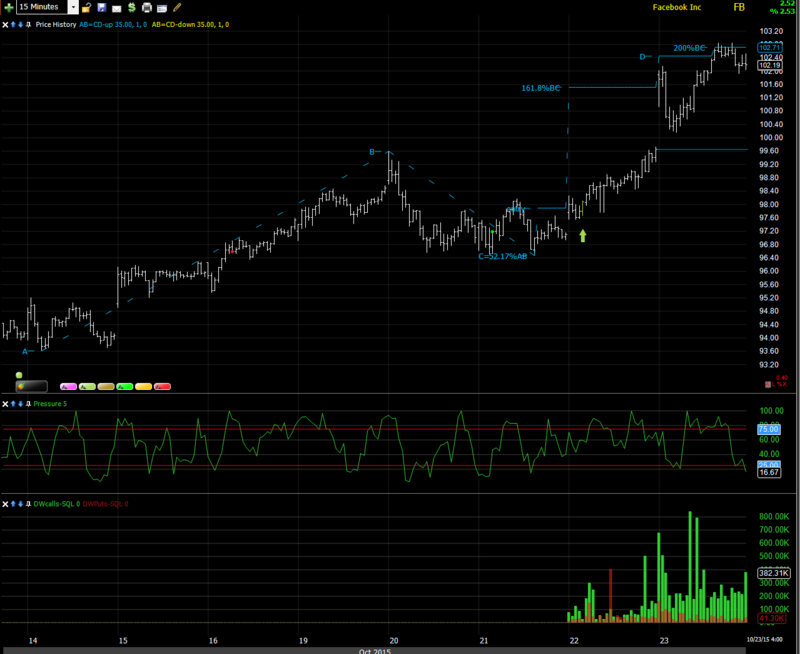 FB has been absolutely fantastic, Friday’s high touched the 113%XA on daily chart to the penny. And from the previous postings on FB you know that on Friday it reached the 161.8%XA target on the 30min chart, we have been mentioning since the beginning of October. 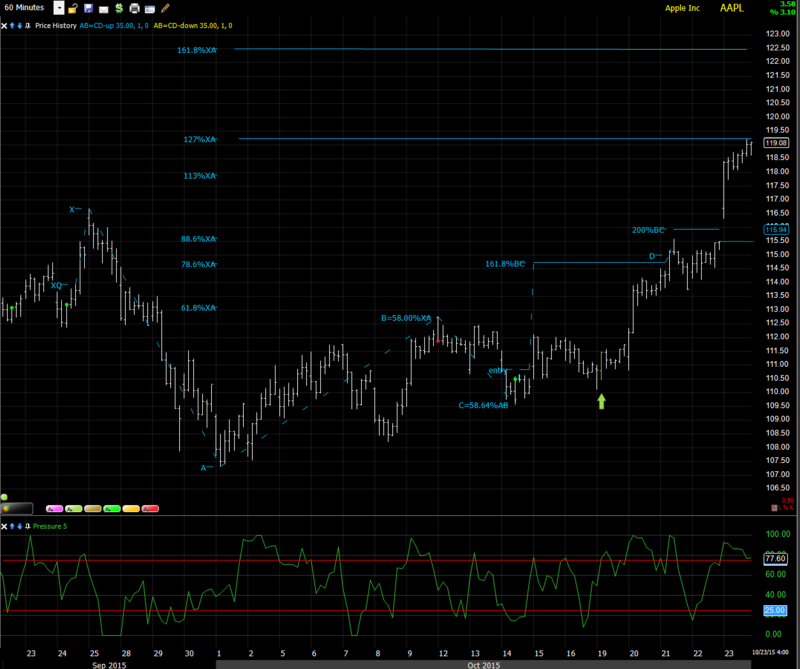 You can see a 107 target as AB=CD PRZ on the daily. However from my experience the 113%XA level many times is cause for a pullback: many breakout traders are getting caught there. 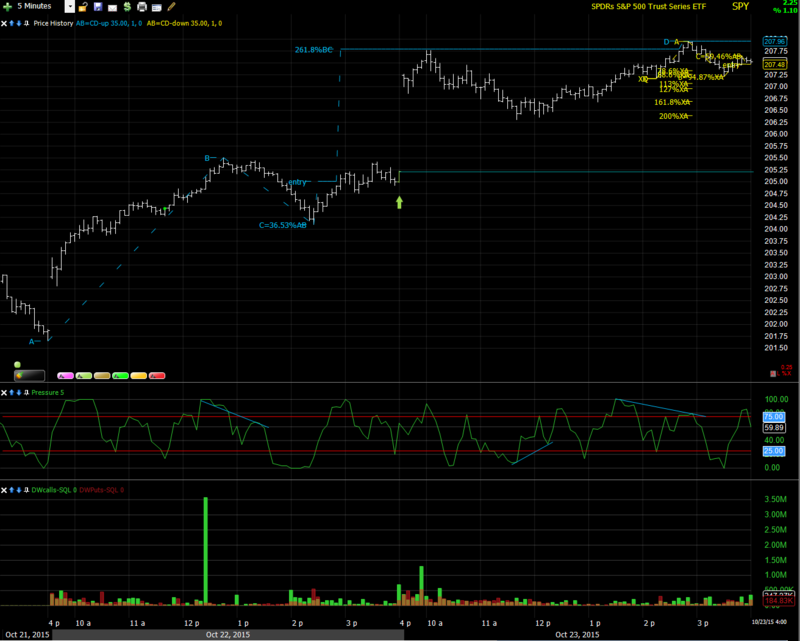 Optionsflow remains uber bullish, relentless call buying. 15min chart shows its at a PRZ as well. I’ll remain trading the same strategy; wait for bullish PRZ’s on short TimeFrames, and trade weekly calls, until it fails. 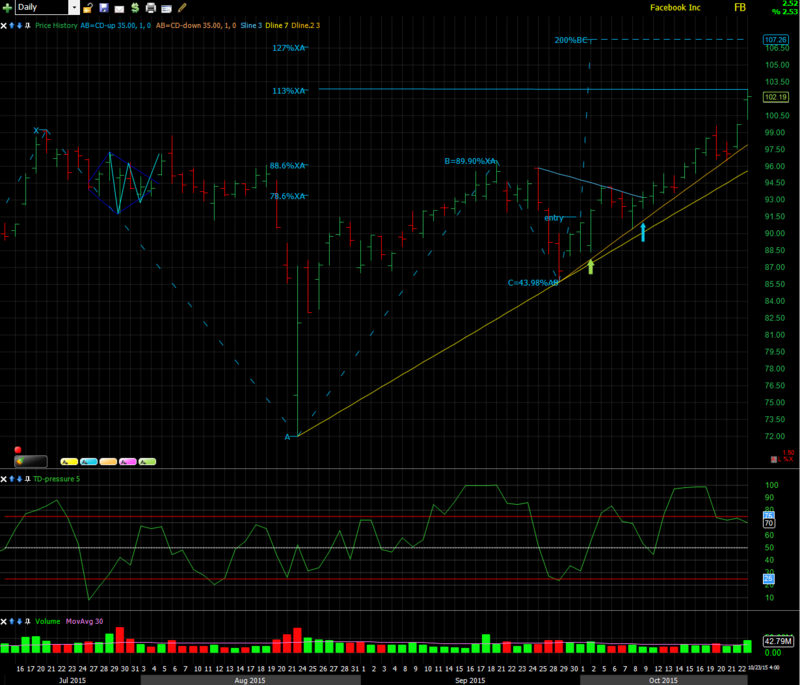 AAPL in a beautiful looking pattern on the 60min. So for Monday, the way things look for now I’ll be waiting it out a little, and see if we can get a little bit of a pullback first. If I see any patterns forming, then I’ll post on twitter.